Discussion in 'Replica Costumes' started by Chevyh0tr0d, Oct 19, 2011. I have not really posted on this forum much, mainly on AL. But I figured since I finished my USCM costume it was time to start. Here are some pictures I took, to try and configure the armor. These were taken about 2 weeks ago after getting my armor from Spat. In these pictures I am growing a rather scruffy beard, this was easily fixed thanks to a few recent job interviews. 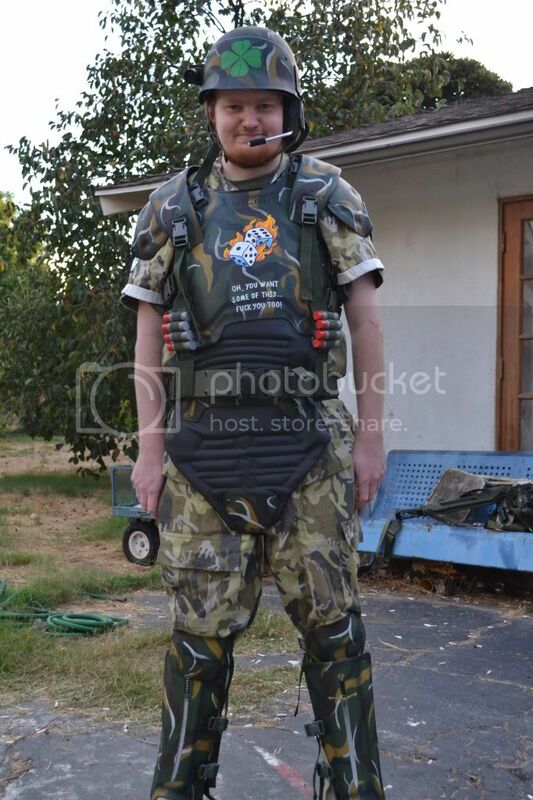 Also I know in this picture my BDU top is not tucked in, I am thinking of keeping it this way as it seems to be easier to move around with my armor on and such. Last I know the Pistol belt was on upside down, this has since been fixed too. You're just a grunt - No offense. One suggestion: Rough up the armor a little bit. Give it that "worn-in" look. Also, where did you get that pulse rifle??????????? As far as that idea goes.I thought about it but decided not to as I was going more for a "fresh from the factory" look as I am a "fresh from boot camp" grunt. Funny you should ask that, I got that HCG from Russ(Rook III) about 9 or 10 months ago. Nice pulse rifle and motion scanner... looks great! I actually choose "Rockabilly Kid" for my Service number AL forum 2ndary nickname as I listen to alot of Rockabilly music, and really am into that scene.As far as Chevyh0tr0d goes I have actually had this nickname since BF 1942 Desert combat. I was always talking about Chevrolet's in every gaming clan I was in. Then when in DC you could very easily take down a taken with a car and some C4 by jihading. I got to be very good at not only avoid everything being shot at me, but letting friends out of my cars to as much as a 90% survivability rate. I then somehow got called a "HotRoding B@$tard" by some other Desert combat clans online, so I simply just combined the two, and the name stuck. Your idea is actually pretty good though, I also am aware of how much it gives homage to Aliens, played through the SP for COD4 and MW2 about 2 or 3 times. thanks rush. The PR is a HCG from Russ(Rook III). The MT is a built one from a guy on the AL forums in Austria(FIDO), took a little trouble to get it shipped to me. I was hoping to pick up a MR about 3 or 4 days after buying his, but he had already spent the cash. So I am stuck with this one, oh well still looks close enough for me to costume with.Maybe in a few years when I get some more spare cash, and one comes up for sale I can grab a MR MT then! I actually choose "Rockabilly Kid" for my Service number AL forum 2ndary nickname as I listen to alot of Rockabilly music, and really am into that scene. In this case, may I suggest "Destruction Boy"? 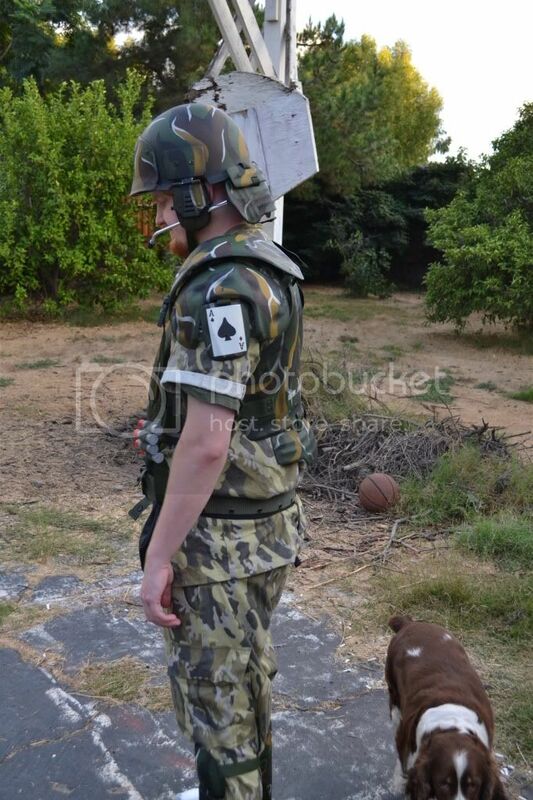 Where did you get your BDU's? 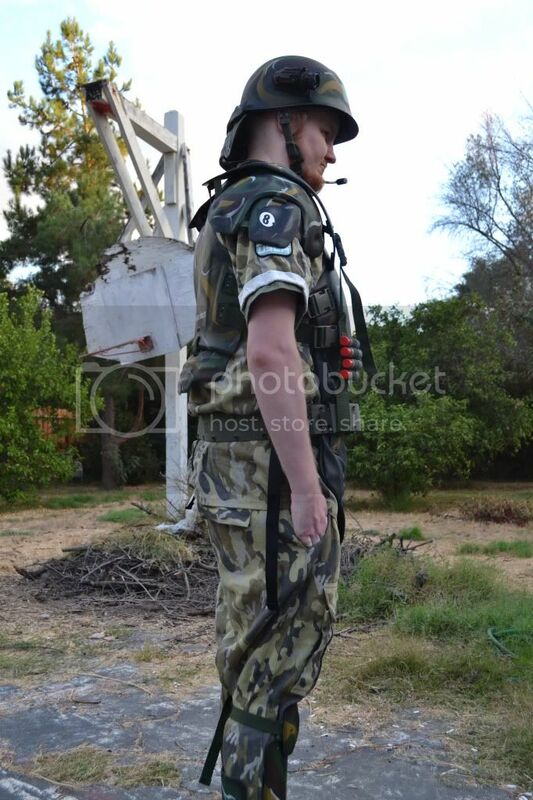 Those look like Man At Arms BDU's, custom printed and made. I have a set of them, really cool... BUT my pair tore a hole in the crotch the first time I wore them , so gotta patch them up. tore a hole in the crotch the first time I wore them , so gotta patch them up. 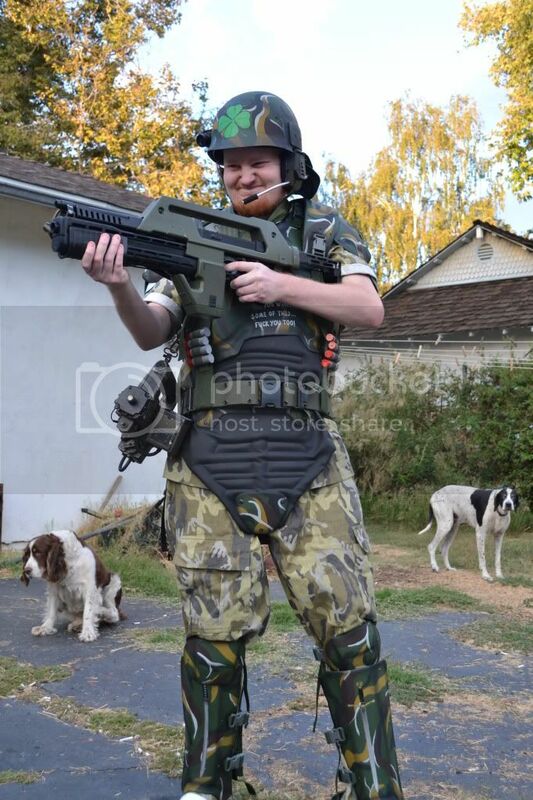 Those BDU's are the scourge of that * costume. 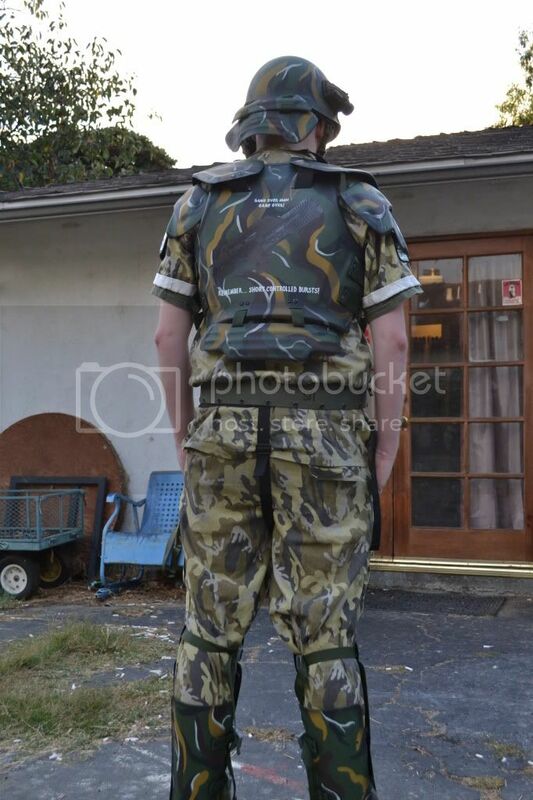 Those look like Man At Arms BDU's, custom printed and made. To answer both questions. Yes they are Man at Arms BDU's. These were the set Nick a Tron(Might be on here too) from the AL was selling a few months back.They were Doc Vito's. I ordered a set from MAA around January. I was one of the 7 sets he was supposed to ship in April, but has yet to. I will keep waiting for them. Until then I will sport these ones of Doc's. It's a great costume! I hope to have a full setup myself sometime in the future. Spats armor is nice but i feel its overpriced and the wait is just far far too long for a set of vacuformed armor..
love the dice, PR and ace of spades paint job. Awesome work! To be honest, he has really improved his wait time I mean it really only took him 4 months to finish my armor when at the time it showed on his sight it would take 10+. As far as the pricing going it is actually pretty cheap, and is ready to wear out of the box compared to say other sets out there. It also seems pretty durable and reliable. For the money I do not think you can go wrong. The simple fact that you can wear it out of the box is great too. I think this or pep are the only 2 ways to go about it for the cheapest full set of armor. I figure if you talked with Spat he could work out a payment plan for ordering a set of armor, at worst he is not and you could save up for it. I have to say though I am very happy with Spat's service. He answered all my emails even when I emailed him 3 or 4 times a day. thanks like I said I was going for a mix of 50's rockabilly and Vietnam style paint job but with Aliens references. I think Matsuo came very close to what I had in mind. Thank you, again that represents my Irish heritage. It also goes with the theme of a mix of 50's and vietnam style paint job. Since a few of the pictures I saw of Vietnam vets having real 4 leaf clovers attached to their helmet. I thought what better way to pay homage to them and my Irish heritage by painting one on the helmet.